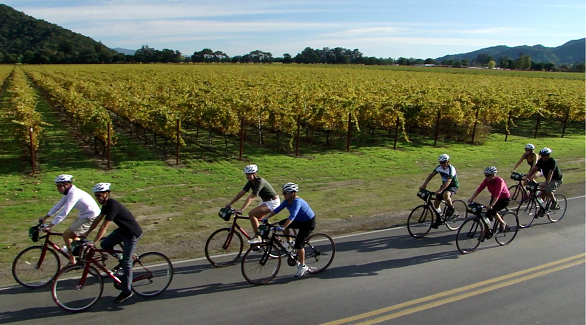 Help Us Improve Bicycling in Napa County! Use our online Wikimap to leave comments about bicycling in Napa County-The Wikimap is now closed for comments. You may still view the map. Thank you for your participation. Comment results will be posted soon! Become a member of the NVTA Active Transportation Advisory Committee (ATAC)-There are currently two openings! (Click Here) for information on the Bicycle Plan Update process. Napa County, with its varied terrain, beautiful scenery and mild weather is ideal for both practical and recreational cycling. Cities in the County are relatively flat and compact, characteristics that are optimal for intra-city commute and untilitarian trips. Inter-city travel on the valley floor via bicycle can be challenging because of the distance between the cities, limited connections, and roads with high speed traffic. The Napa Valley Vine Trail, a 47 mile shared use path (Class I) currently under construction, will provide a safe, convenient option for bicycling for commuters and all levels of recreational users. Outside of the cities and valley floor, the County's mountains, valleys and scenery provide a "world class" experience that is physically challenging and attractive for recreational cyclists. NVTA has adopted a long range strategic goal of having 10 percent of all trips made by bicycle in Napa County. The Countywide Bicycle Plan is one way NVTA looks to accomplish this goal, in close partnership with the governments, non-profit organizations and citizens of the community. 1. A specific set of existing and proposed Class I, II, and III bikeways, presented on a set of maps and linked set of data tables that describe the routes, including their beginning and end points. 2. A set of supportive policies and programs designed to make maximum safe use of existing routes, and to promote turning "proposed" routes into reality.